Garth England was born in Bristol General Hospital in 1935, four years before World War II broke out. He worked for most of his life as a paperboy, telegram boy, milkman, and railwayman. In his later years, he was also a secret artist. At age 70, after decades spent in south Bristol neighborhoods, England moved into Hengrove Lodge, a residential care home. 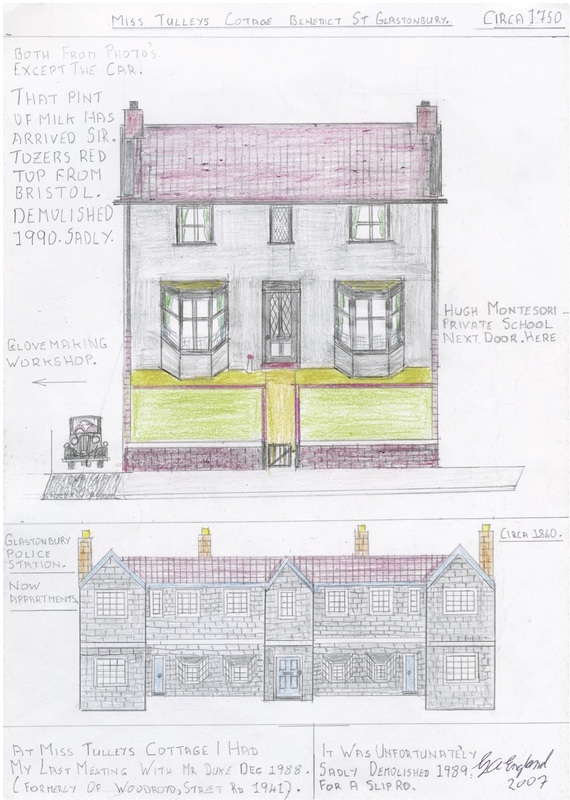 There, using colored pencils and A4 sheets of paper, he began to draw everything he could remember of his life in Bristol. “The second son of a second son, I was just in time for King George V Silver Jubilee Celebrations on 6th May,” he wrote of his birth in endearingly self-mythologizing narration. Between 2006 and 2013, from both photographs and from his near-photographic memory, England completed hundreds of drawings. 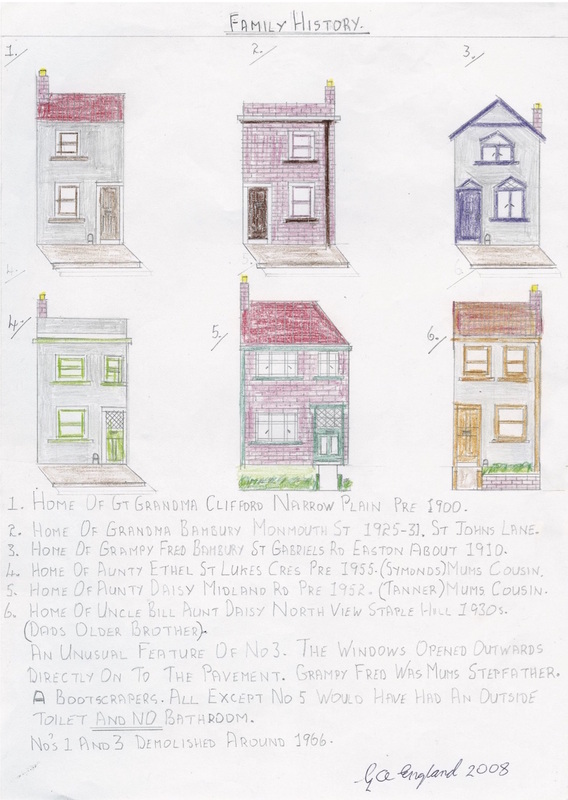 With an odd mixture of nervous precision and scribbly childlike coloring, he drew the city’s architecture: Cottages of his teachers, his piano school (“I was a disaster”), the homes of all his relatives, homes along his milk delivery route. He meticulously illustrated the city’s most recognizable buildings: the Bristol Royal Infirmary, St. Werburgh’s Church, Temple Meads train station, and Bristol New Gaol, where the last execution took place in Britain, in 1964. 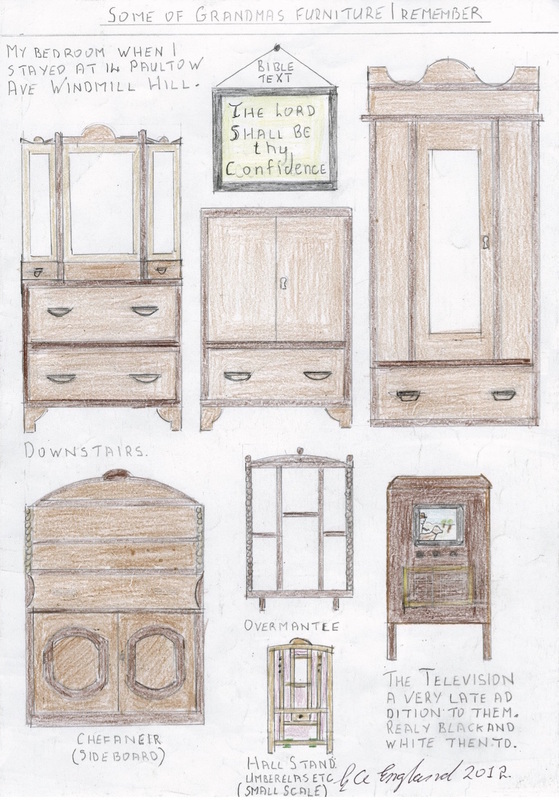 He drew furniture both dated and new: his dad’s smoking cabinet, his gramophones, his homemade bookcase, the sign above his Victorian grandmother’s wardrobe (“The Lord Shall Be thy Confidence”). England illustrated the city’s wartime trauma — “Broken lines indicate war damage by incendiary bombs 1941/2,” he captions one drawing. 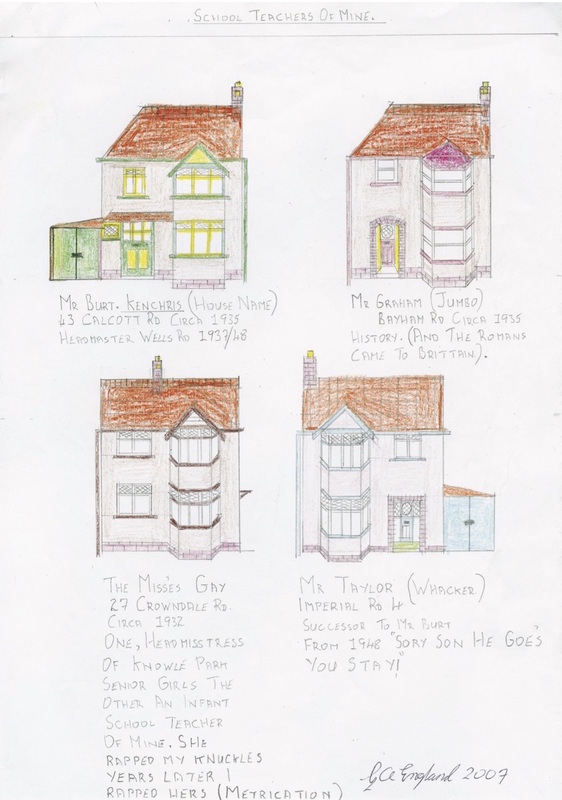 Using these drawings as blueprints, you could recreate Garth’s whole architectural world. Together they chronicle a childhood lived through World War II. They’re also a singular document of the development of Britain’s Welfare State and social housing provision and the birth of modernist architecture. England never married, had no children, and was only visited occasionally by his brother at the residential care home. 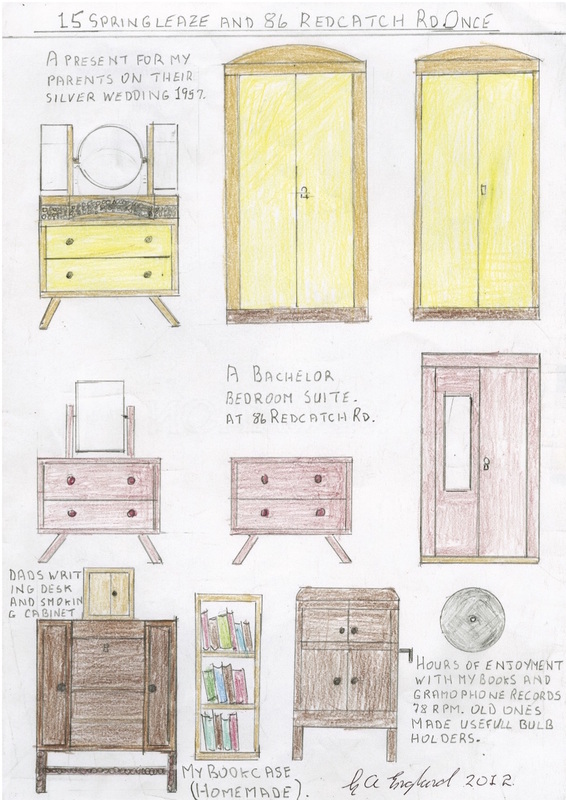 These drawings may never have seen the light of day if it hadn’t been for Jo Plimmer, an engagement manager working on a contemporary art project called Future Perfect. 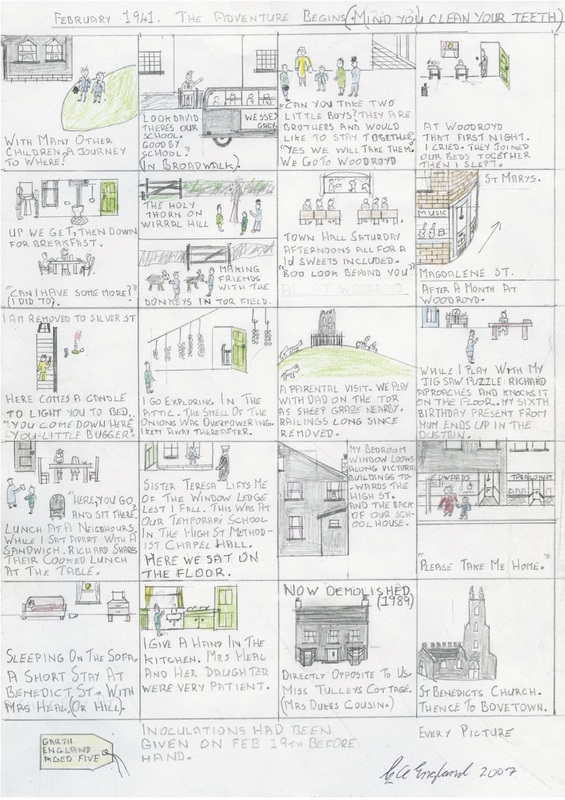 In 2013, Plimmer visited Hengrove Lodge to talk to residents about incorporating photographs and drawings into a curtain in the Hengrove Community Center. England suggested Plimmer “might be interested” in a pile of drawings he stored on a shelf in his room. Now, Future Perfect has published a selection of these drawings in a book published by Redcliffe Press, Murdered With Straight Lines: Drawings of Bristol by Garth England. Despite his obsession with perfectly straight lines — he drew with rulers and erased mistakes are faintly visible in each drawing — he admitted the drawings aren’t all accurate. He notes where he’s removed balconies or added extra rows of windows. Though England did not have the most sophisticated draftsmanship skills, the collection is disarming and entrancing. His lack of self-consciousness and reverence for the mundanities of daily life is somehow refreshing and the specificity of his details make for a vivid 2-D Bristol. It’s the kind of document Wes Anderson could only dream of making as a film prop, but subverts the twee-ness that often results from intentionally trying to make something so naively styled. Garth England’s Murdered With Straight Lines: Drawings of Bristol, published by Redcliffe Press, is available from Amazon and other online booksellers.